If you feel compelled at any point while reading, click the image for the Inception 'bwaahhhh' sound. So totally relevant to yesterday’s show-and-tell about game emulation and data forensics, some fans of Goldeneye for N64 found a working emulator of a ZX Spectrum 48k hidden inside the game. Apparently the developers wanted to see if emulating an older console was possible on N64 and left the files in the Goldeneye ROM. For anyone who’s ever played Donkey Kong 64, the ZX Spectrum 48k emulator makes an appearance as a playable arcade cabinet in that game — both games were made by development house Rare. Really interesting to know that this is an actual functioning in-game emulator. So to recap, people running an N64 emulator on their computer discovered a ZX Spectrum 48k emulator in their emulated game. It’s an odd question, but the answer is startling. A few years ago, a physicist named Russell Seitz asked himself, “How much does the Internet weigh?” By which he meant, how much does the whole thing, this vast interlocking web of content pulsing through 75 to 100 million servers staggered all over the world, what’s its total weight? The Internet is not something I would ever think to weigh. It’s like weighing a radio program. Why bother? Seitz says it weighs about as much as a fat strawberry. Others, recalculating, say the Internet’s even lighter, more like a teeny grain of salt. The answer is the Internet runs on electrons. That’s how the information is stored. And electrons are very, small. But they do have mass. Einstein taught us that. So it’s possible to take all the energy (E) powering the internet and, using Einstein’s equation, (E=mc2) turn that energy into something we can weigh. And it turns out a lot of energy doesn’t weigh very much. [See my footnote for the mathematical details.] Consider, for example, an email message. Well, if we weigh everything — all five million terabytes of information, what do we get? When those electrons produce an image of a young woman lying shot in the street in downtown Tehran, shot by a sniper, falling to the ground, dead, that picture may weigh next to nothing, but the hundreds of thousands of people who see it are altered, literally changed, by what they’ve seen. And the bearers of those brains want to share what they’ve seen, so the image gets passed to more and more people, and is copied, brain to brain to brain, machine to machine to machine. This happened not just to the image from Teheran, but also that picture of that cop in California zapping kids with pepper spray, to Moammar Gadhafi surrendering, to women being stripped an beaten in Cairo’s Tahrir Square, to all those folks challenging Putin in Moscow. And the electrons that make that happen, what if their weight is 0.0000000000000000001 grams? So what? You can weigh the Internet till you are blue in the face, but the grams won’t tell you anything important. The Internet connects people. What it is doesn’t matter. What it carries, that matters. Ideas aren’t like chairs or tables. They have their own physics. They make their own weight. Ask yourself: How much does “of the people, by the people, for the people” weigh? So far this semester we have discussed many digital History topics. From the discussions of digitalization of Civil War records in the article Crowdsourcing the Civil War and digital collections during our trip to the library to listen to a lecture from the university’s archivist on searching those collections to Rosenzweig’s article Scarcity or Abundance? 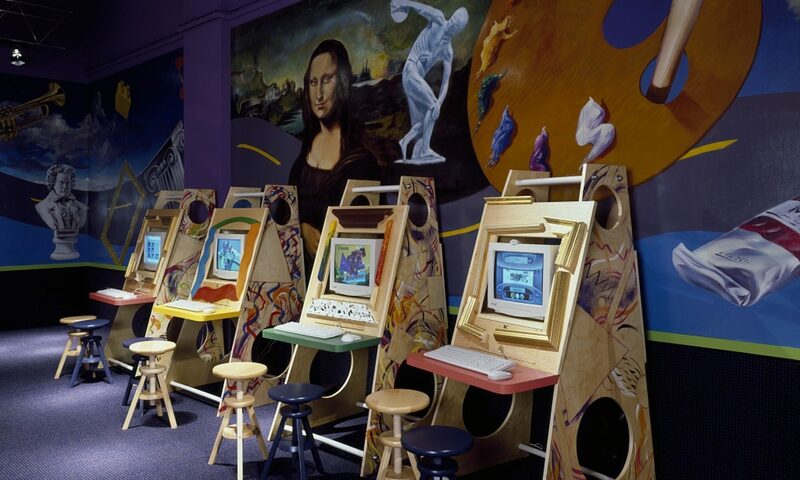 Preserving the Past in the Digital Era and looks at such digital collections as the September 11th archive and the Wayback machine, we have learned a lot about digitization when it comes to certain collections. One digital collection that I would like to share with everyone is the Documenting the American South Project sponsored by the University Library at the University of North Carolina at Chapel Hill. Documenting the American South (DocSouth) is a digital publishing initiative that provides Internet access to texts, images, and audio files related to southern history, literature, and culture. Currently DocSouth includes sixteen thematic collections of books, diaries, posters, artifacts, letters, oral history interviews, and songs. The project has been developing for over a decade with the aims of gathering and digitizing all materials related to Southern culture. Most of the collections come from Southern holdings. The project dates back to 1996 with the Pilot Project to digitize a half dozen highly circulated slave narratives. The project is designed to provide digitized primary materials to researches, scholars, and students. These sources offer a Southern perspective on many parts of American history. The collections included in the project include: The Church and the Southern Black Community, The Colonial and State Records of North Carolina, Driving Through Time: The Digital Blue Ridge Parkway in North Carolina, The First Century of the First State University, First-Person Narratives of the American South, Going to the Show, The James Lawrence Dusenbery Journal (1841-1842), Library of Southern Literature, North American Slave Narratives, The North Carolina Experience, North Carolina Maps, North Carolina and the Great War, Oral Histories of the American South, The Southern Homefront (1861-1865), Thomas E. Watson Papers, and True and Candid Compositions: The Lives and Writings of Antebellum Students at the University of North Carolina. As a personal note, I wrote my undergraduate thesis on Sherman’s March to the Sea during the Civil War largely with the assistance of the primary sources available in the Documenting the American South Project. This brings up a question that we have discussed in class. If primary sources are digitized these days, then can serious researchers and scholars base their research solely on these digital sources? Or does historical research require scholars to do in person research? This is definitely something that we have to think about in the digital era. 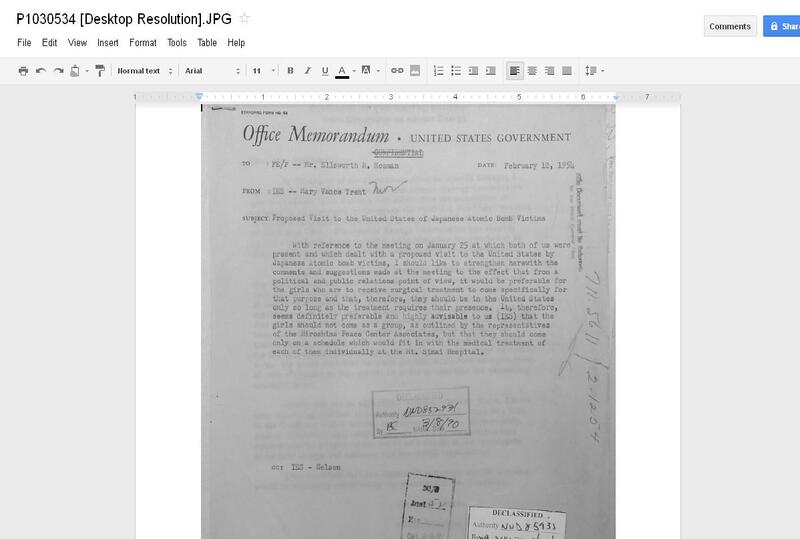 Aside from doing (and knowing) everything, there is a neat feature on Google Docs that you might find immensely helpful if you find yourself doing archival research. When researching at the archives, most people take digital photographs of the documents they’re looking at. At the end of a day you’re left with hundreds of photographs that you now have to sort through, catalog, read, and take notes on. Personally, I used to print all of my images and then spend hours going through them highlighting the key points and making general notes based on what the documents contained. 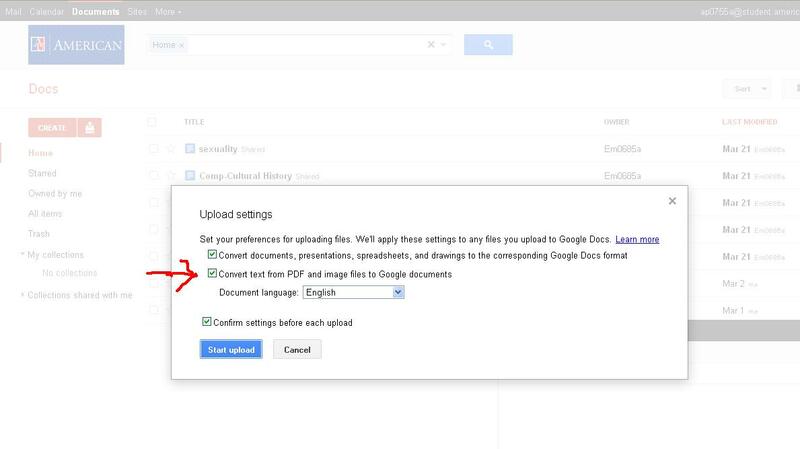 Google Docs now has a feature where you can upload a photograph of a document and it will convert it into keyword searchable text. It can be done completely automatically in two easy steps. 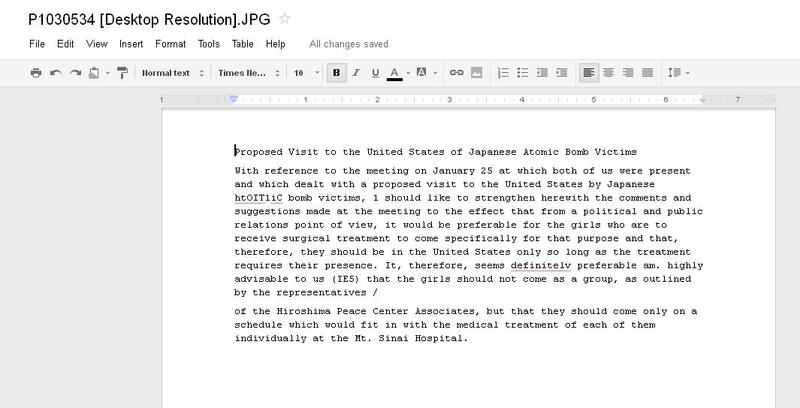 The text conversion is never 100% perfect and the accuracy depends on how clear the original document is, but it is still far more efficient than manually transcribing or taking notes on each document. An additional benefit is that you now have an archived copy of all your files in case something happens to the originals. Plus you can also use the search feature on Google Docs to keyword search all of your documents at once in case you need some information you remember seeing but can’t remember what document it was in. As we’ve seen throughout this course, there are various ways to connect the public to history using digital resources. Along with this, teachers are progressively acknowledging the significance of using online tools in the classroom to keep up with today’s generation of tech-savvy students. Perhaps a resource they may find useful is the National Archives’ online teaching tool for educators called DocsTeach. DocsTeach allows teachers to create their own interactive activities, using primary sources from the National Archives digital vault to do so. Teachers are encouraged to create interactive maps, make sequential timelines based on primary documents and images, build connection-strings, match certain documents to a specific concept or topic, etc. These activities are especially valuable because teachers can assign activities for students to do themselves and later share with the classroom. DocsTeach also offers multiple existing lessons created by the National Archives. Each lesson pertains to a certain historical era in American history, ranging from 1754 to the present. Within each are several activities relating to that lesson. For instance, the lesson Civil War and Reconstruction (1850-1877) contains six different activities in which students can compare civil war recruitment posters, assess the effectiveness of the Freedmen’s Bureau, use the Emancipation Proclamation and historical congressional records to solve problems, and search other documents to find out what else was happening during this period. Each activity is entirely primary source-oriented. Teachers are also given the option to reformat, or skin, each existing activity to create their own prototypes. Each primary source is also categorized under a certain historical era to help teachers better find them to include within their activities. These categories consist of written documents, images, maps, charts, graphs, audio and video. There are thousands of sources to choose from, allowing teachers an even greater opportunity to create multiple activities for their disposal. Thanks to the creation of DocsTeach, the National Archives has given educators an invaluable resource to connect students to history using digital tools. This is a fantastic resource that anyone hoping to enter the academic field should consider using in the future.